Big Agnes Big Six Camp Chair. When you're used to camping in comfort, the Big Six Camp Chair is your jam. 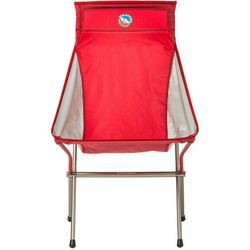 Designed with deluxe chillin' in mind, the Big Six has a tall back, wide seat, and sits an accessible 18" off the ground. Quick and easy to set up with a shock-cord pole set, and packable enough for stashing in your truck, trunk, or travel bag for wherever you're going to need it. Big Six Camp Chair from Big Agnes on Vimeo.